ROANOKE, VA--(Marketwired - Oct 17, 2013) - In a recent blog post titled, "Establishing Realistic Tummy Tuck Expectations," Virginia plastic surgeon Enrique A. Silberblatt, MD details how many of his patients hope to attain a figure that matches either magazine models or the way these patients themselves looked when they were in their late teens. "The majority [of patients] claim to have realistic expectations," says Dr. Silberblatt, "but in the back of their minds they really do want to look like that." According to Dr. Silberblatt, "The most common misconception is that liposuction will achieve the shape patients desire and the tummy tuck will get rid of the extra skin left behind in the process." However, he says when fat is located behind the muscles of the patient, liposuction is not able to access this volume and only the top layer of a patient's fat will be thinned during treatment. While patients may be able to lose an inch or two of thickness with the combination of these procedures, Dr. Silberblatt says patients who have a lot of extra fat beneath the muscle will not experience a dramatic change in their overall shape. He notes that his patients who fall under this category will need to alter their current eating and exercise habits in order to reduce this intra-abdominal fat. As with any drastic change in dietary or exercise habits, Dr. Silberblatt recommends that his plastic surgery patients consult with a physician, dietician, or trainer beforehand. The second most common misconception Dr. Silberblatt's patients have expressed about the tummy tuck procedure is in regard to post-operative downtime. Some patients believe they will be able to return to work after two to three days, but the Virginia plastic surgeon stresses that while most patients can expect a downtime of approximately two weeks, some patients may need to wait longer. He adds: "If the patient's job requires substantial physical activity, time off may be as long as six weeks, especially if heavy lifting is involved." Ultimately, Dr. Silberblatt notes that the key to a successful tummy tuck procedure, much like the key to any successful procedure, is having realistic expectations. From his experience, patients who go into surgery with clear knowledge of the typical outcomes and what can be realistically achieved are often the happiest with their cosmetic results. Dr. Silberblatt is a graduate of Princeton University and earned his medical degree from New York Medical College. Dr. Silberblatt went on to complete his general surgery residency at the University of Massachusetts and his plastic surgery residency at the University of Pittsburgh. He is a board-certified plastic surgeon and is credited with establishing the first microsurgery lab in Roanoke. Dr. Silberblatt is available for interview upon request. 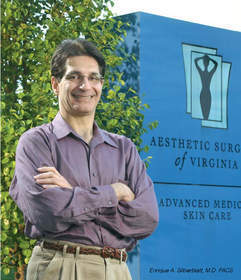 For more information about Dr. Silberblatt and the Aesthetic Surgery of Virginia, visit silberblatt.com. To view the original source of this press release, click here: http://www.silberblatt.com/news-room/virginia-plastic-surgeon-debunks-2-common-tummy-tuck-misconceptions/.